Megabus is a discount intercity bus carrier that operates in various regions of the United States, Canada, and the United Kingdom. Fares vary depending on the date traveled and the time reservation is made. Advanced reservation is required. 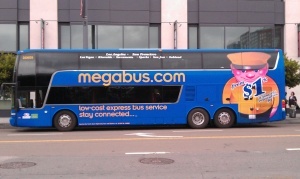 Megabus generally stop at curbside locations and at major transit center. This page was last edited on 8 March 2016, at 18:18.